Linda, a mom of three school-aged children, is at home doing laundry. The kids are at school. Her husband is at work. It’s quiet. She looks at the clock and realizing the time, darts over to the large radio in the living room to turn it on. The voices coming through the radio share stories of love, romance, and family. After a few minutes, the story gives way to a upbeat commercial about the latest and greatest laundry detergent. Do you know what Linda is listening to? That’s right, they were designed to captivate a predominantly female audience in order play commercials for soap and dish detergent. Newspapers, sporting events, TV shows, billboards, podcasts, and magazines. All do the exact same thing. Get a bunch of eyeballs and attention focused on the entertainment of choice. Show them an ad. Get paid by the advertiser. It’s a tried-and-true business model. It’s been around centuries. It’s not going anywhere (unfortunately). 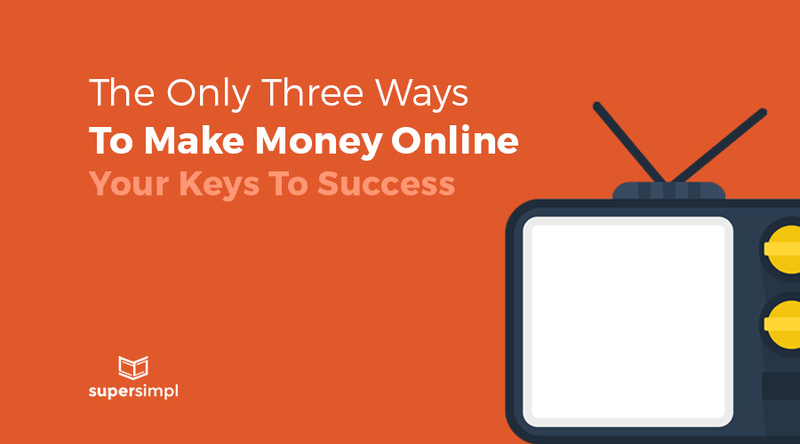 This is, in fact, one of the three ways to make money online. BONUS: Grab this free download, “10 Proven Ways to Earn $10,000 Per Month Online”, before you go. I’ll also send you my free mini course on How to Make $1,000 Per Month With the Knowledge and Skills You Have. Here are some examples online. Video ads that play before you watch a YouTube video. ‘Sponsored’ posts in your Facebook news feed. Ads at the top of your Google results. Banners on the sides of news sites. These are all based on the same business model. And when done well, it works. And that’s why businesses are willing to pay for ads. And that’s where you benefit. You can use your knowledge and skills to build a website, blog, community, following, magazine, or even a following on social media. In fact let’s say you’re on Instagram. You’re thumbing through posts. You see somebody that clearly spends half their day in the gym while the rest of us are chugging coffee and eating donuts at our desks. That person has a few selfies taken at the gym. Of their buddy doing pull-ups. And then a photo of them drinking a protein shake. Holding the canister, which has been perfectly adjusted to show the label. In the text beneath the photo, they’ve mentioned the product by name and probably a link. They were paid to do that. Once your audience is large enough, you can get paid to show ads or sponsored posts as well. Better hit the gym! I’m kidding. It doesn’t just work for health and fitness. And don’t start worrying that you’ll never have a large enough audience. Not every business is big business. For example, a local online magazine that covers a city could easily sell ads to car dealerships, realtors or restaurants in that city. A fellow podcasting friend of mine, Glen The Geek, has a niche podcast for people with horses. He also happens to have a sponsor that sells horse manure forks. How many other places do they really have to advertise? But I can’t stress this enough. When we talk about ways to make money online, anything is possible. Anything! This is pretty straightforward, but the options are endless. And what classifies as a product may surprise you. Obviously, you can start your own online business selling physical goods via an eCommerce site. You can make money online selling clothes, household goods, sporting equipment, and really, just about anything you can find on Amazon. Then there are handmade goods, which you can sell via sites like Etsy. You can make money selling one-of-a-kind items like handmade carvings. Or you can sell a line of items, such as handmade scarves. Sell used goods via eBay, Craigslist, or the fast-growing letgo.com. You can also post in local communities on Facebook. In fact, my wife sells toys that our kids outgrow via a community on Facebook. Did you know that you can sell goods via Amazon. Usually new, but there are used items, especially books. This is where it starts to get interesting. At least to me anyway. For starters, you can use Amazon’s FBA (Fulfillment By Amazon) program to sell your own goods. You ship them the new items in appropriate packaging, with a unique label on them. Amazon posts them online. Sells them. And ships them for you. You get access to customers and Amazon’s fulfillment center. They get 30% of whatever you sell. Here are two common ways to make money online using Amazon’s FBA. Both can be, and have been, turned into a $10,000 per month online income stream. a) buy items from nearby stores that are marked down 75-90%, and then sell them at retail price. If you shop on Amazon at all, you’ve most likely purchased items in both of these categories. For example, lipstick, toys, and seasonal goods are often times sold by individuals that have purchased them on clearance. Other things like vitamins, yoga mats, and travel mugs may have been designed by someone working at home. Manufactured by a company in China. Then shipped to and sold through Amazon. Just head over to Amazon and look for the “sold by” verbiage. In addition to selling physical goods online, there are endless options for selling digital goods. Digital goods can be in the form of eBooks, courses, videos, tutorials, or really anything that can be bought and transmitted via the internet. They can be sold through online marketplaces, ecommerce sites, ecommerce platforms, or your own website. You can even sell through Facebook now. You’re probably familiar with buying books, games, apps, and music through sites like iTunes. Did you know that graphic designers sell logo designs, powerpoint presentations, and flyers via Graphicriver? You can sell website templates through Themeforest. Your own music and audio clips through Audiojungle. And even your own photos via Photodune. Create them once. Sell them over and over again. Rather than delivering a product, you can provide a service. You can sell tax preparation, consulting, coaching, editing, writing, graphic design, legal help, and just about anything else you can think of. And many things you haven’t thought of. For example, through Fiverr, you can sell research. Phone messages. Graphic design. Video editing. And on and on. In addition to selling a service you perform, you can also sell access to software. We call this Software as a Service, or SaaS. Microsoft Office is now sold as a service. You no longer walk into Best Buy, buy the discs and download the software to your machine to use as long as you like. You lease/rent/license the use of the software. Online. Pandora radio, Quickbooks online, and even Amazon Prime all fall under this category. There is really nothing new under the sun. Business is business, and people are people. And all of the income streams and examples I’ve used up to now can be classified as one of these three ways to make money online. And many times, you can easily do more than one. If not all three. For example, you could have a blog about gardening, where you show people how you grow various herbs and vegetables. There are dozens of variations of each of these. Some simple. Some complex. But the possibilities are endless. And so is the opportunity. The internet is still new. And with sites like Facebook connecting the world’s online population, there is plenty of room for you. And for what you have to offer. Remember, you don’t need a massive audience. If you sell $50 worth of products or services to 1,000 people over the course of a year, that’s $50,000!